All on four implants is a dental treatment where four implants are used to replace a complete arch of missing teeth in either the upper or lower jaw. 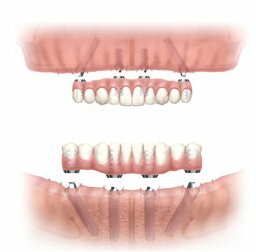 With all on four implants, the implants are typically placed into the jawbone in a one stage procedure. The implants are immediately loaded to support a fixed dental bridge usually consisting of 10-12 teeth. 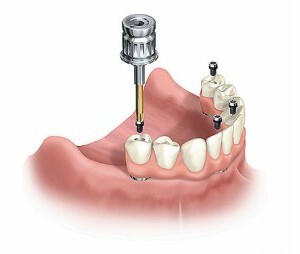 A fixed dental bridge is then secured onto the implants on the same day of surgery. Brief background of all on four implants. Dental implants have improved immensely over the last 30 years and have helped many regain function and confidence which comes with losing natural teeth. One of the most exciting breakthroughs in dental implants is the concept of immediate function. Immediate function is the placement of implants into the jaw bone and attaching fixed teeth onto the implants on the same day. This method of placing dental implants certainly has many advantages as it provides the patient with immediate replacement teeth which are very similar to natural teeth. Over the years the concept was developed and scientific studies proved that the concept worked and was highly successful. The concept of ‘same day teeth’ or ‘teeth today’ grew in popularity amongst patients needing multiple dental implants. With further research and development the all on four implants concept was developed by dentist Dr Paulo Malo, Lisbon. Dr Malo researched a technique in which just four implants were used in order to support all of the upper or lower teeth. The all on four implants protocol was born. Advantages of all on four implants. In the majority of cases patients are able to receive fixed teeth on the same day of surgery. This is a very big advantage as many patients struggle to cope with removable dentures. The treatment is very well accepted in those patients suffering from advanced gum disease and dread the thought of having to wear full dentures. With all on four implants, infected mobile teeth can be removed and replaced with implants on the same day. Unlike more complex dental implant procedures only four dental implants are used. This can reduce the over all cost of the treatment compared to other techniques where 8-10 implants are used per arch. In most cases the technique focuses on using the natural bone of the patient and avoids bone grafting procedures. Not all patients have sufficient bone available for dental implants to be placed. With tooth loss or gum disease the jaw bone resorbs ( shrinks ) and makes dental implant placement more complex. Traditionally dental implant surgeons would carry out bone graft procedures to increase the amount of bone prior to placing dental implants. These procedures were not only painful, but necessitated long periods of healing times ( 6-12 months ) for the bone grafts to heal. Bone can be harvested from the hip, chin or side of the jaw. Bone grafts can not only cause additional pain and complications at the donor site but can also contribute to higher risks of failure. With all on four implants bone grafts are avoided so the protocol has a higher success rate, and takes less time to heal. Patients are able to eat normally days after surgery.With all on four implants this is not only a big confidence boost it also helps patients recover faster by making eating and speaking easier. 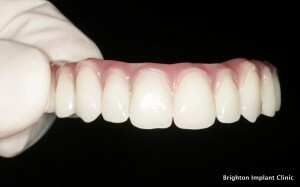 The fixed dental bridge is very comfortable and highly aesthetic. 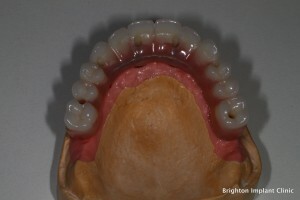 The fixed bridge is slightly ‘bulkier’ than natural teeth, unlike full dentures the roof of the mouth is not covered making speech and taste sensation normal. 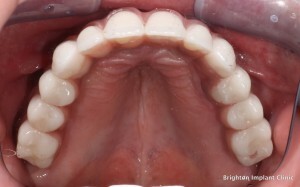 The all on four implants bridge can be made to your preferred specification. 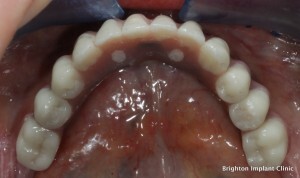 Tooth colour, shape, size and positions can be adapted to the patients request. Predictable procedure with success rates around 95-95%. If adequate amounts of bone are available 6 implants can be used, this is called an ‘all on six’. Using six implants could reduce the chances of bridges fracture and implant failure. Dis-advantages of all on four implants. Because only 4 implants are used, each implant can be ‘stressed’ or ‘strained’ more during normal function when compared to traditional full arch treatments where more implants are used. The greater the number of implants used, the less strain or stress each implants will undergo during function. The distance between each of the all on four implants is greater when compared to traditional full arch techniques that use more implants. This increased distance can lead to a higher incidence of bridge fractures of the fixed dental bridge. The bridge may ‘flex’ during function in the areas where it is unsupported by the all on four implants. Bridge fractures can be repaired in a dental implant laboratory and depending on the bridge material and extent of fracture can take as little as 2-3 hours to repair. All on four implants may not be an ideal solution for those cases where multiple teeth with long roots in bone need to be removed. During these extractions large sockets will be created during the extractions and these may not provide the best foundation for immediate implant placement. ( especially when dealing with firm long rooted canine teeth and premolars ). In some cases it may be necessary to delay implant placement to allow for bone to heal and extraction sockets to fill with new bone. All on four implants treatment may not be ideal for patients with excessive gummy smiles. In these cases bone ‘reduction’ may need to be carried out during all on four implants surgery in order to reduce the gummy smile. provide adequate lip support for such patients.This may result in a less aesthetic appearance with an altered facial profile. These advantages and disadvantages are the opinion of the article writer who has performed numerous all on four implants procedures. Conclusion of all on four implants treatment. All on four implants is an excellent solution for those patients wanting to replace a full arch of missing or damaged teeth with fixed, highly aesthetic comfortable teeth. The protocol has been documented and scientific studies have proven that it is highly successful with success rates over 95%. 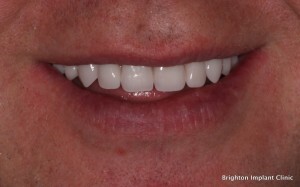 Dr Bruno Silva is an implant surgeon who works at the Brighton Implant Clinic. 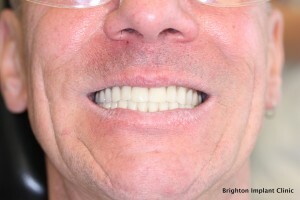 The clinic provides all on four implants to patients in its three branches located in Brighton, Hove and Hailsham. Dr Silva underwent training at the Malo Clinic in Lisbon, under the supervision of Dr Malo himself. If you have any questions or would like to discuss the all on four implants procedures please feel free to Contact Brighton Implant Clinic or Call us on 0800 111 6623.